NASA’s Space Shuttle Discovery flew more missions than any other spacecraft. In its 27 years of active service, Discovery completed 39 successful missions and deployed 31 satellites including the Hubble Space Telescope. Discovery’s heroic crews manned the ""Return to Flight"" missions in 1988 after the 1986 Space Shuttle Challenger tragedy, and the 2005 and 2006 missions following the Space Shuttle Columbia disaster in 2003. Discovery’s second “Return to Flight” mission after the Space Shuttle Columbia disaster was launched on July 4, 2006; Discovery ia the only Space Shuttle to launch on United States Independence Day. Space Shuttle Discovery made many noteworthy missions in her long career; Discovery’s inaugural mission carried Judith Resnik, the second American woman to reach space. Discovery conveyed Eileen Collins to space; the first female shuttle pilot. Congressman and Astronaut John Glenn flew on Discover; he was 77 years of age, and that made him the oldest man to reach space. Discovery transported Sergei Krikalev, the first Russian launched in an American spacecraft, and Discovery was the first Space Shuttle mission to rendezvous with the International Space Station. Space Shuttle Discovery was decommissioned on March 9, 2011; she was placed on public display at the Smithsonian Institution's National Air and Space Museum in Virginia. 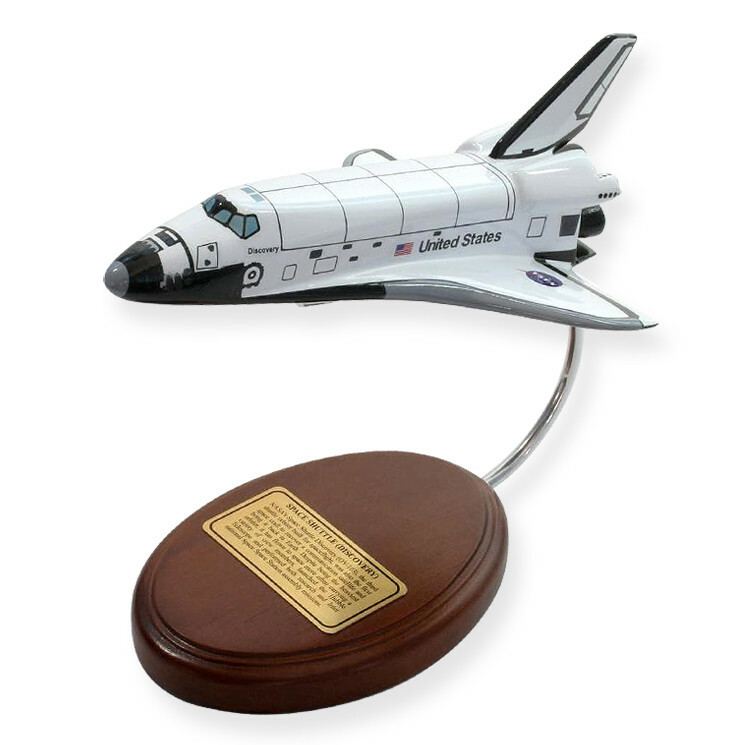 Discover the joy of collecting authentic reproductions with the Space Shuttle Orbiter. Captured in flight mode and dramatically presented, the Space Shuttle Discovery Orbiter wood model dazzles the imagination of friends and family. Flawless detail and rugged build make this authentic Orbiter depiction stand out from all others. Bring the Discovery Orbiter to your home today.